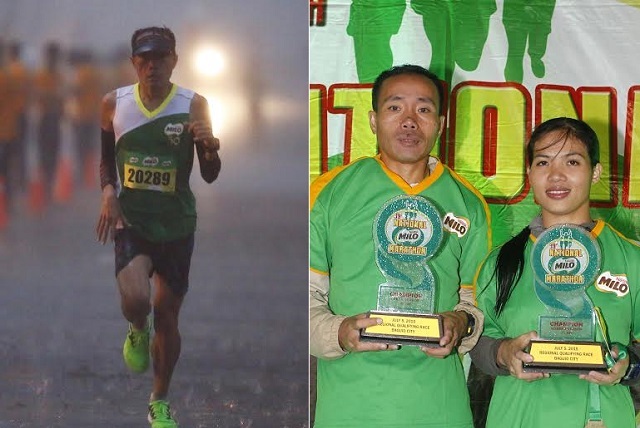 Runners prove they can overcome challenges as they conquered the wet roads at the 39th National MILO Marathon Baguio qualifying leg on Sunday. The rains were no match for veteran marathoner Julius Sermona and up-and-coming runner Gretchen Felipe, who placed first in the 21K running event for the male and female categories. The inclement weather did not dampen the spirits of the almost 7,000 runners who joined the race. Philippine Air Force member Sermona bested his rivals, finishing with a time of 01:18:44. Michael Tolac (01:19:14) and Modesto Estoesta (01:22:07) followed in second and third place, respectively. In the distaff side, Felipe, a Cordillera Career Development College freshman, posted a new personal record as she secured a comfortable victory with a time of 01:39:46. Second placer Jessica Hieras (02:00:38) and third placer Rashel Pena (02:02:37) completed the top 3 winners. Sermona and Felipe secured their slots in the National Finals and each took home the top prize of P10,000 in cash and a trophy. Both will go head-to-head with the country’s best runners at the National Finals in Angeles on December 6, where the MILO Marathon King and Queen titles are up for grabs. This year’s King and Queen will be sent by MILO to the USA on all-expense paid trips, for a chance to run in the prestigious 2016 Boston Marathon. The race will resume in Tarlac (July 12), and will head to Balanga (July 19), Manila (July 26), Calapan (August 2), Lipa (August 9), Naga (August 16), Lucena (August 30), Iloilo (September 20), Bacolod (September 27), Tagbilaran (October 4), Cebu (October 11), General Santos (October 18), Davao (November 8), Butuan (November 15), and Cagayan De Oro (November 22). The National Finals will be held on December 6 in Angeles, Pampanga.